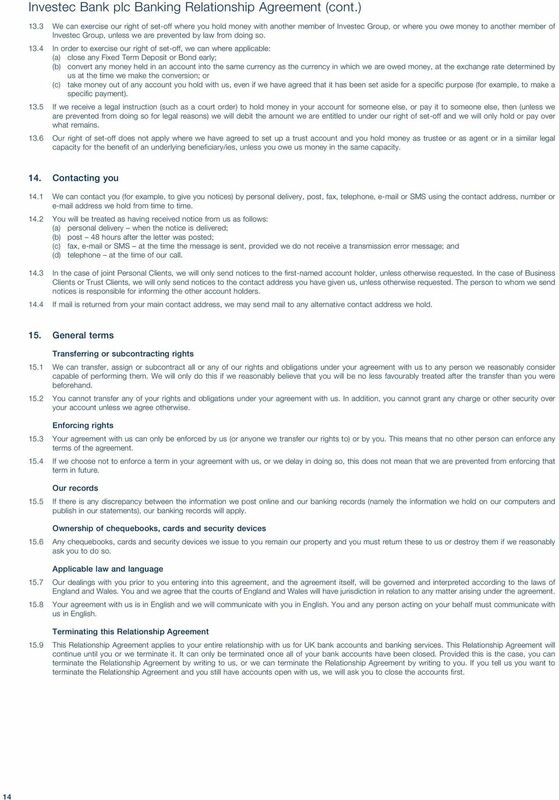 15 Investec Bank plc Banking Relationship Agreement (cont.) Definitions Arranged Overdraft a formal overdraft facility that we agree to make available on your account, subject to an overdraft limit. Bond an account which is only on offer from us for a limited period of time. 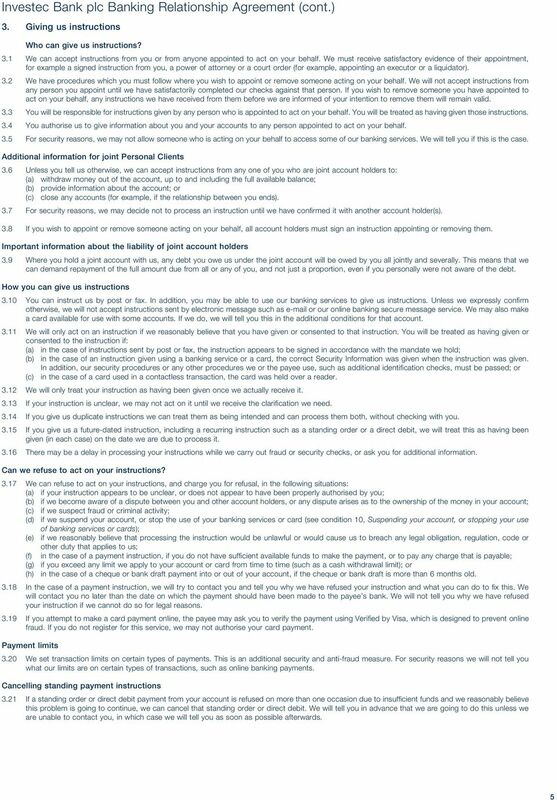 The additional conditions for your account will explain if the account is a Bond. Calendar Day any day of the week, including Saturdays, Sundays and UK bank holidays. All references to times are to UK times. Fixed Term Deposit an account which we agree with you will be held for a fixed period of time, after which the account will be closed and the money either returned to you or rolled over into a new account. HSBC branch any HSBC Bank plc branch operating in the United Kingdom. Branch hours may vary. Incorrect Payment a payment that: (a) has not been executed according to instructions given to us by you, by an additional cardholder or by anyone else acting on your behalf, or by or through a payee; or (b) has been processed outside our maximum processing time for that type of payment; or (c) has not been processed at all. Managed Rate an interest rate which is set or varied by us from time to time in our sole discretion. The additional conditions for your account will explain if the interest rate is a Managed Rate. 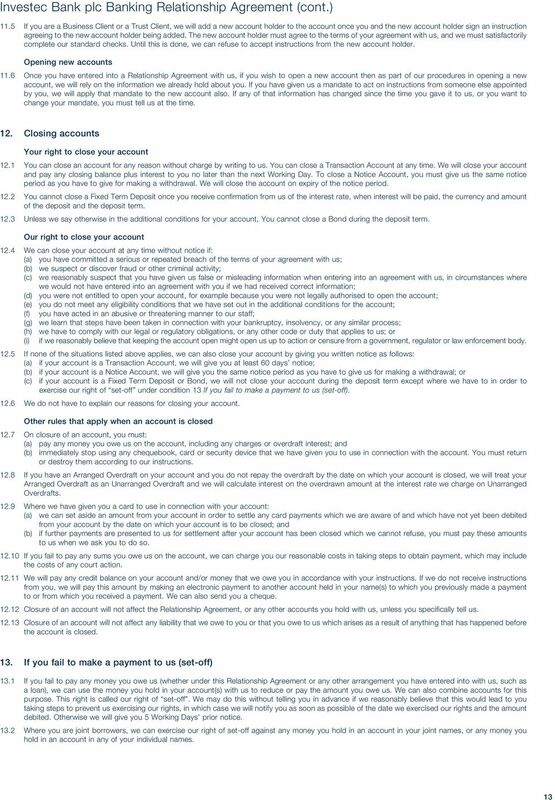 Notice Account an account which only allows money to be withdrawn at the end of a specified notice period. 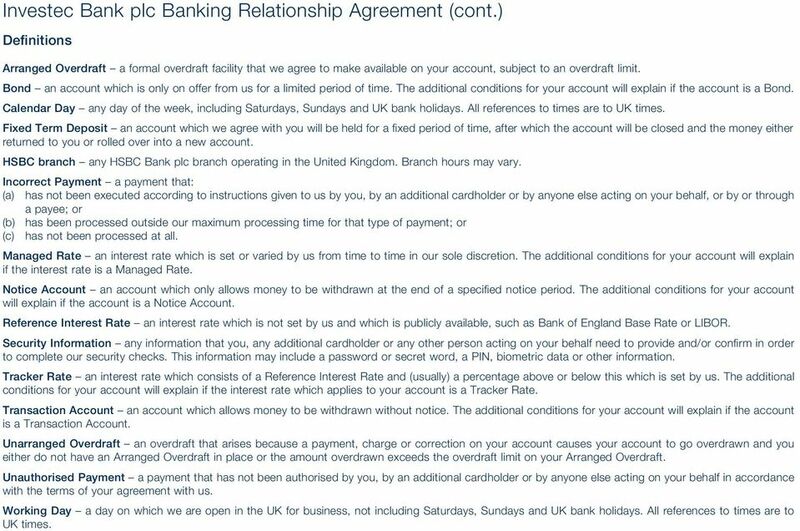 The additional conditions for your account will explain if the account is a Notice Account. Reference Interest Rate an interest rate which is not set by us and which is publicly available, such as Bank of England Base Rate or LIBOR. 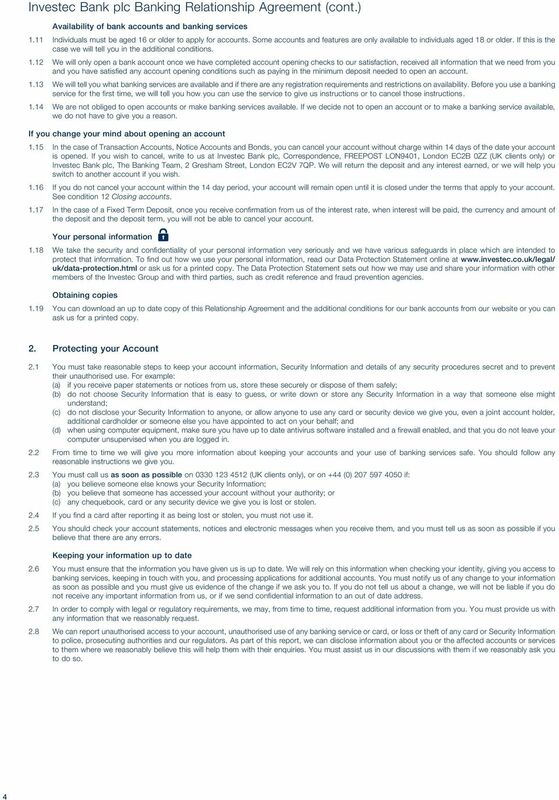 Security Information any information that you, any additional cardholder or any other person acting on your behalf need to provide and/or confirm in order to complete our security checks. This information may include a password or secret word, a PIN, biometric data or other information. Tracker Rate an interest rate which consists of a Reference Interest Rate and (usually) a percentage above or below this which is set by us. 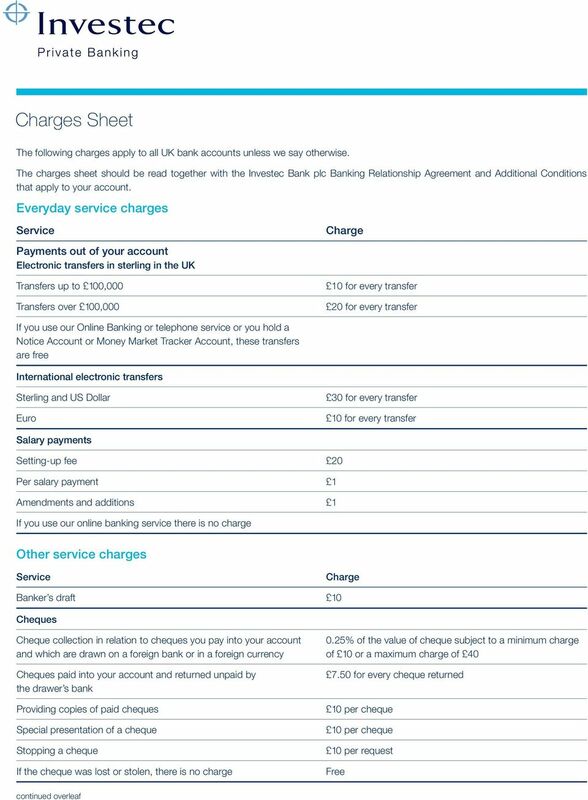 The additional conditions for your account will explain if the interest rate which applies to your account is a Tracker Rate. Transaction Account an account which allows money to be withdrawn without notice. 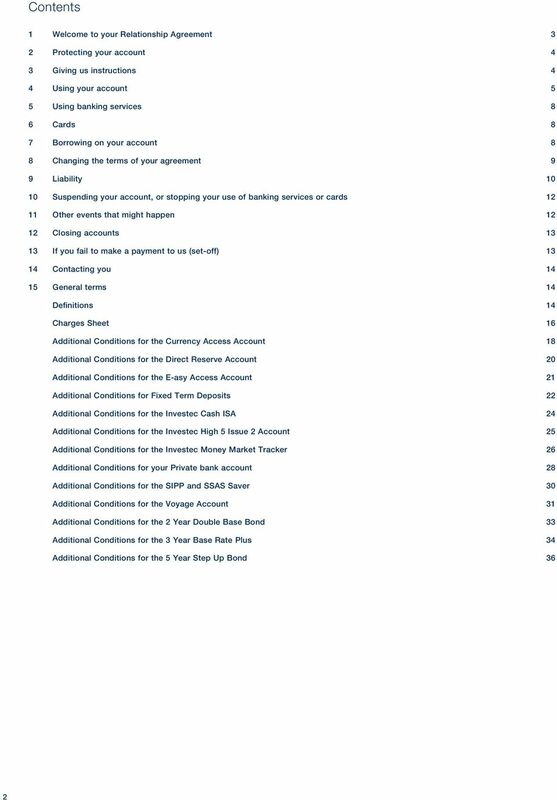 The additional conditions for your account will explain if the account is a Transaction Account. Unarranged Overdraft an overdraft that arises because a payment, charge or correction on your account causes your account to go overdrawn and you either do not have an Arranged Overdraft in place or the amount overdrawn exceeds the overdraft limit on your Arranged Overdraft. 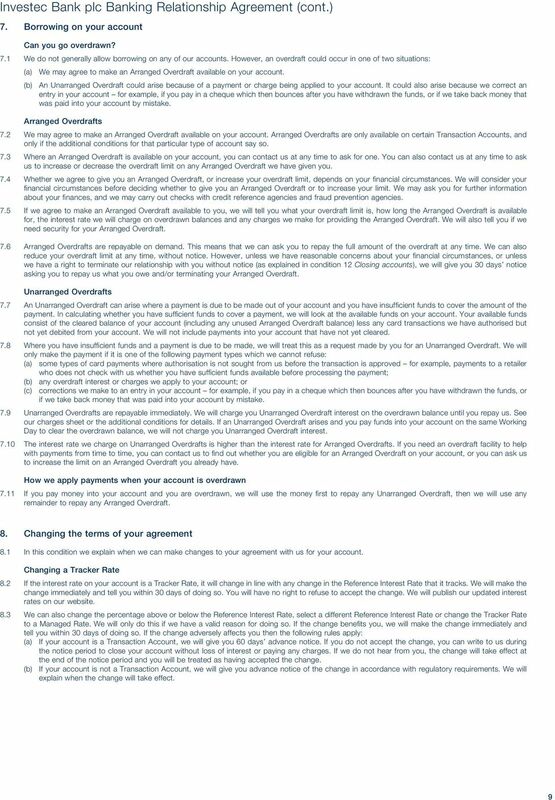 Unauthorised Payment a payment that has not been authorised by you, by an additional cardholder or by anyone else acting on your behalf in accordance with the terms of your agreement with us. Working Day a day on which we are open in the UK for business, not including Saturdays, Sundays and UK bank holidays. All references to times are to UK times. 18 Charges Sheet Returned payments If a payment is returned due to insufficient funds Technical reasons 20 per returned payment plus 15 for the letter advising you of the returned payment 10 per returned payment Service charge for Business Cheque Account only 15 Copy of a statement To provide a reference if you or another bank request this Audit letters Tracing funds where it is not the Bank s mistake Transaction charges (Business Cheque Account only) 5 for each statement 10 plus VAT per reference A minimum of 15 plus VAT per request A maximum of 25 per trace The first 80 debit or credit transactions in any calendar month is free. For subsequent debit or credit transactions in that month the charge is 1 per transaction. Interest charges on overdrawn balances If your account becomes overdrawn, we will charge you interest on the overdrawn balance at the rate of 15% per annum above the Bank of England Base Rate (as that rate varies from time to time). Interest will be charged daily and applied monthly until you repay all amounts due to us. 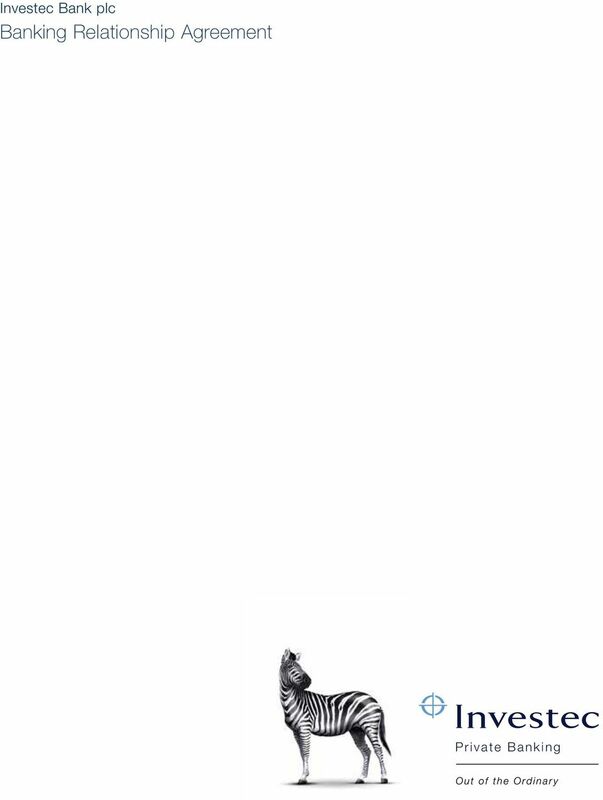 August 2014 CS-01 Investec Private Banking is a part of Investec Bank plc (registered no ). Registered address: 2 Gresham Street, London EC2V 7QP. Investec Bank plc is authorised by the Prudential Regulation Authority and regulated by the Financial Conduct Authority and the Prudential Regulation Authority and is a member of the London Stock Exchange. 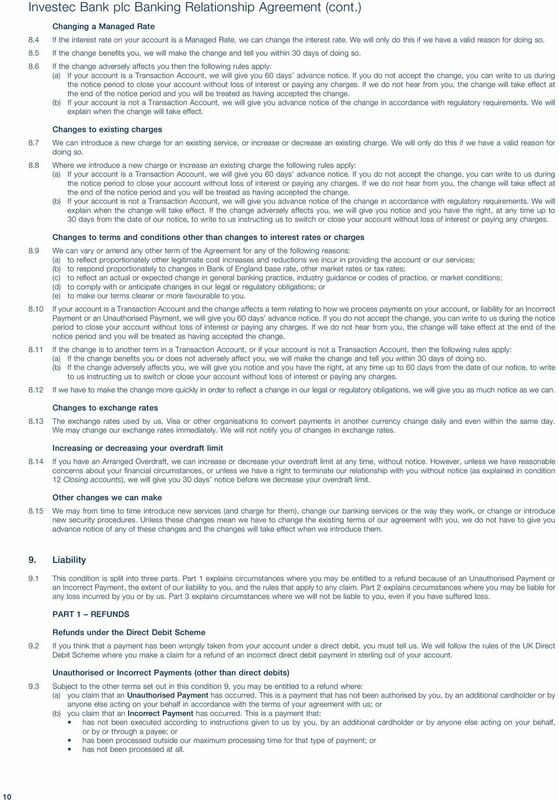 19 Additional Conditions for the Currency Access Account These additional conditions should be read together with the Investec Bank plc Banking Relationship Agreement. If these conditions are inconsistent with the terms set out in the Relationship Agreement, these conditions will apply. Words with capital letters which are not defined in these additional conditions have the meaning given to them in the Relationship Agreement. The Currency Access Account is a Transaction Account. 1 Availability 1.1 The account is only available to Personal Clients and Business Clients. 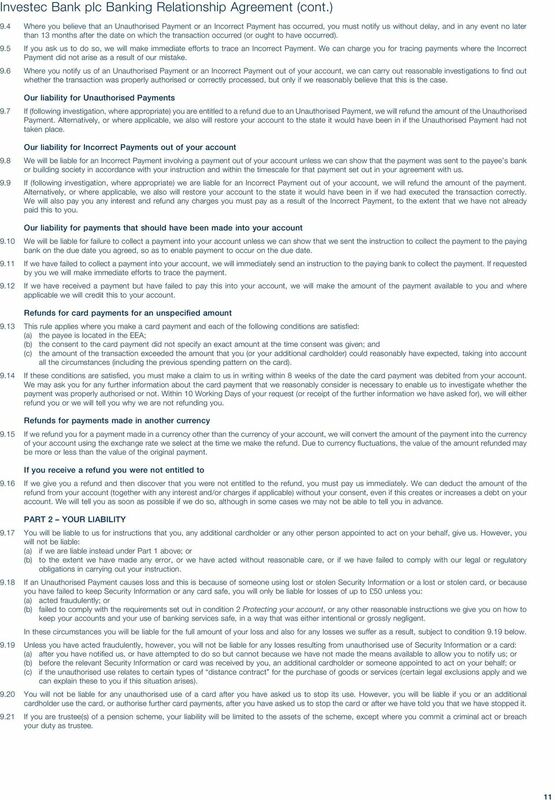 1.2 The requirements under condition 1.3: (a) only applies to Currency Access Account(s) opened on or after 1 December 2015; and (b) do not apply if you have an existing bank account with Investec Bank plc. 1.3 To hold the account, you must: (a) have made an initial deposit of a minimum of 25,000 or the currency equivalent of 25,000 if you open your account in another available currency listed under condition 2; or (b) carry out foreign exchange transactions worth at least 25,000 or the currency equivalent of 25,000, if you open your account in another available currency listed under condition 2, within 12 months of opening your account. 2 Opening your account Depending on the currency that you select, the account can be opened as: (a) a GBP sterling account; (b) a euro account; (c) a US dollar account; (d) a South African rand account; (e) a Swiss franc account; (f) an Australian dollar account; (g) a New Zealand dollar account; (h) a Swedish krona account; (i) a Canadian dollar account; (j) a Japanese yen account; (k) a Singapore dollar account; (l) a Danish krone account; (m) a Hong Kong dollar account (n) a Norwegian krone account; or (i) an Israeli Shekel account. 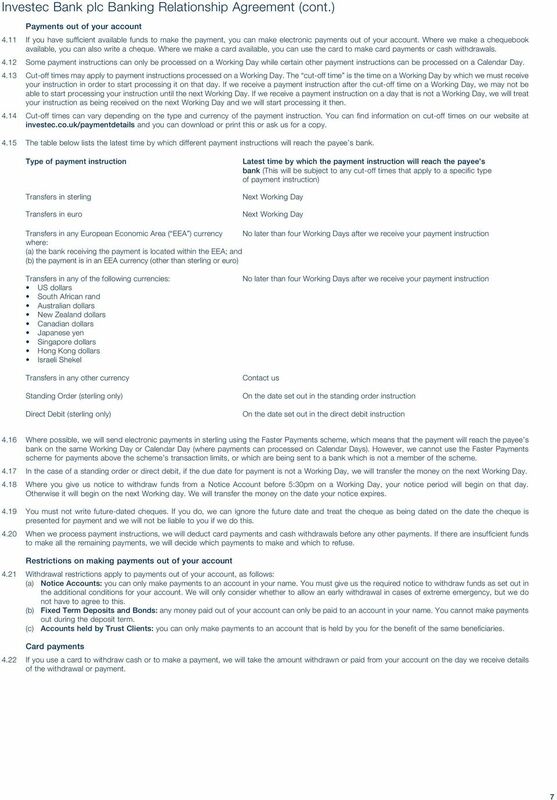 3 Payments into your account You can only make electronic payments into your account. 4 Interest 4.1 You do not need to have a minimum amount in the account to earn interest. 4.2 The interest rate on the account is a Managed Rate. Refer to our website or call us for details of the interest rate applicable. 4.3 We will calculate interest daily and pay interest monthly. 5 Payments out of your account You can only make electronic payments out of your account. 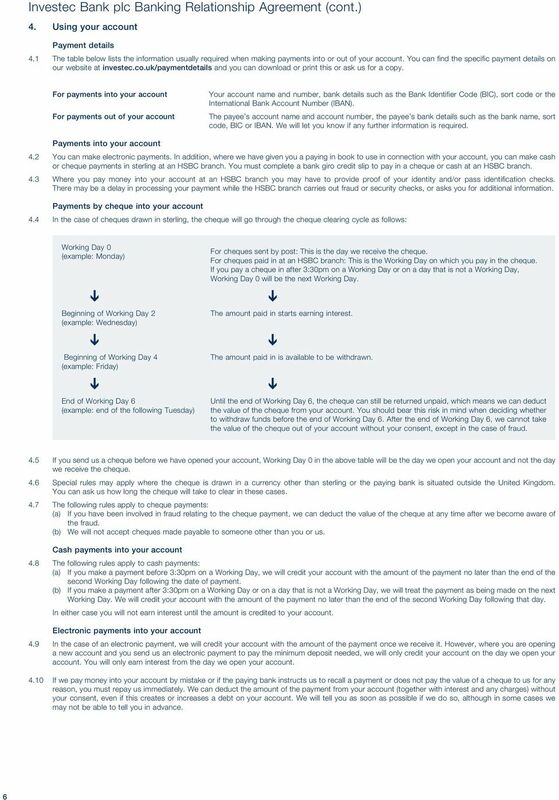 You cannot make payments out of your account by standing order or by direct debit. 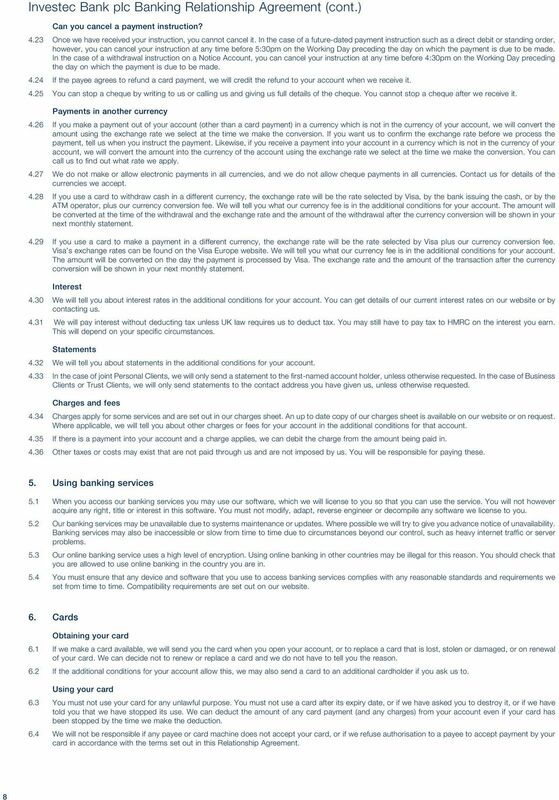 6 Statements and notices We will make a monthly statement available via online banking. We will send you an notification telling you when your statement is available. If you ask us to, we will send you a monthly paper statement. 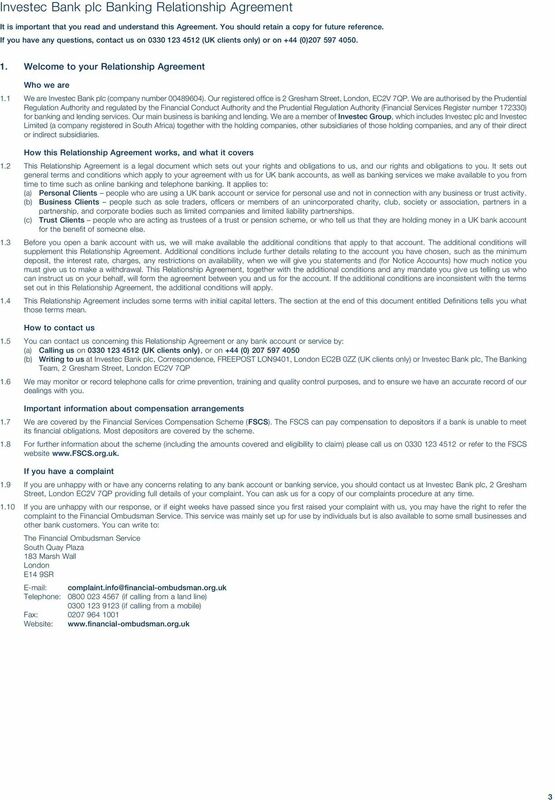 May 2016 AC-CAA-04 Investec Private Banking is a part of Investec Bank plc (registered no ). Registered address: 2 Gresham Street, London EC2V 7QP. Investec Bank plc is authorised by the Prudential Regulation Authority and regulated by the Financial Conduct Authority and the Prudential Regulation Authority and is a member of the London Stock Exchange. 20 Additional Conditions for the Direct Reserve Account These additional conditions should be read together with the Investec Bank plc Banking Relationship Agreement. If these conditions are inconsistent with the terms set out in the Relationship Agreement, these conditions will apply. Words with capital letters which are not defined in these additional conditions have the meaning given to them in the Relationship Agreement. The Direct Reserve Account is a Notice Account. 1 Availability 1.1 The account is only available to Personal Clients. 1.2 The account may be opened as a Sterling Direct Reserve Account, a US Dollar Direct Reserve Account or a Euro Direct Reserve Account. 2 Payments into your account 2.1 The minimum amount you must deposit to open the account is: (a) 25,000 in the case of a Sterling Direct Reserve Account; (b) US$25,000 in the case of a US Dollar Direct Reserve Account; or (c) 25,000 in the case of a Euro Direct Reserve Account. 2.2 The maximum amount you can hold in the account is: (a) 2,000,000 in the case of a Sterling Direct Reserve Account; (b) US$2,000,000 in the case of a US Dollar Direct Reserve Account; or (c) 2,000,000 in the case of a Euro Direct Reserve Account. 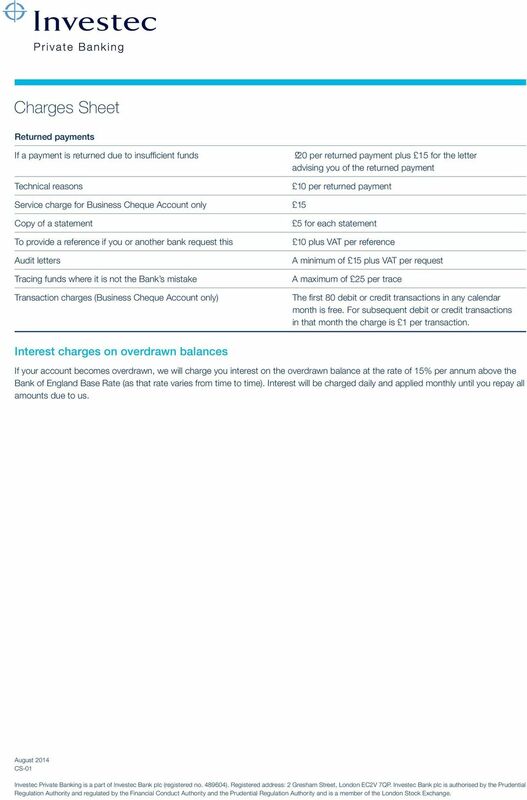 3 Interest 3.1 The interest rates on the account are Managed Rates. Refer to our website for details of the interest rates applicable. The website also explains the minimum amount you must hold in your account in order to earn interest, which depends on the version of the Direct Reserve Account you hold. Alternatively, you can call us for this information. 3.2 We will calculate interest daily and pay interest either monthly or annually, depending on the option selected by you from time to time. 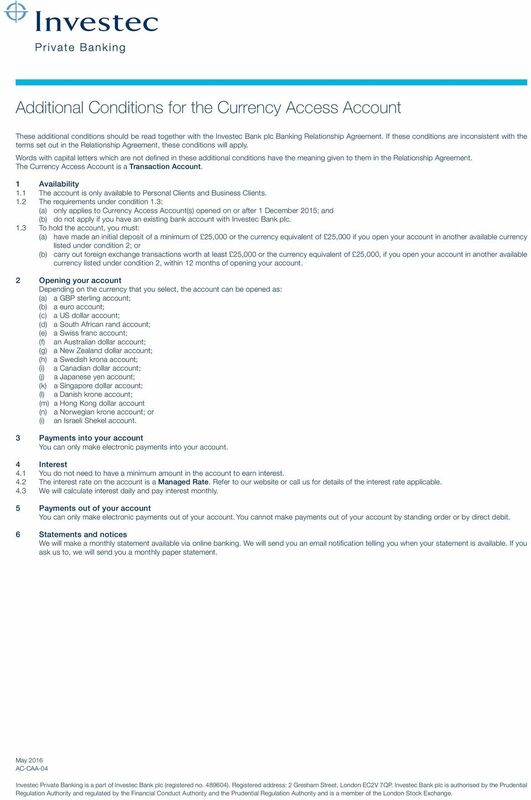 4 Payments out of your account You must give us one month s notice to withdraw funds from the account. 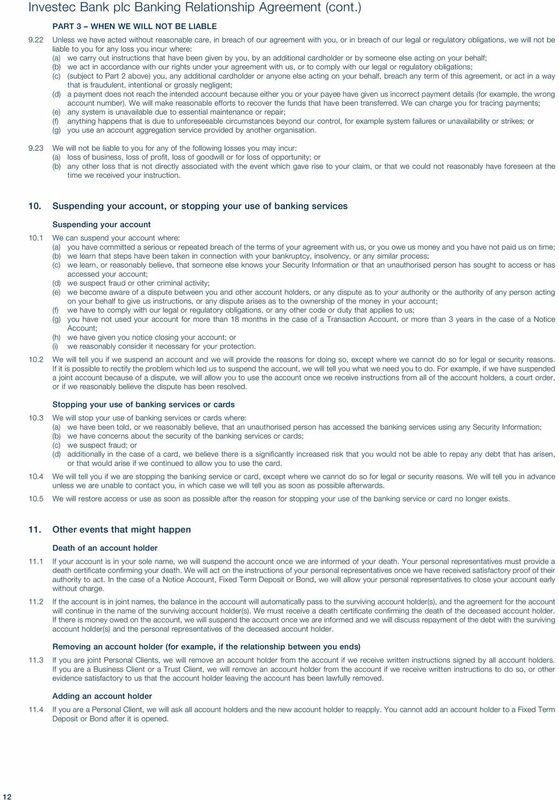 5 Statements and notices We will make a quaterly statement available via online banking. We will send you an notification telling you when your statement is available. If you ask us to, we will send you a quarterly paper statement. 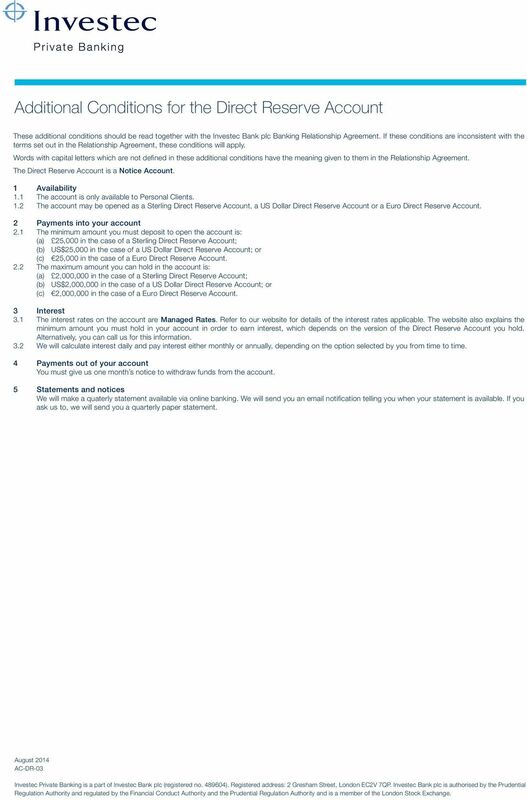 August 2014 AC-DR-03 Investec Private Banking is a part of Investec Bank plc (registered no ). Registered address: 2 Gresham Street, London EC2V 7QP. Investec Bank plc is authorised by the Prudential Regulation Authority and regulated by the Financial Conduct Authority and the Prudential Regulation Authority and is a member of the London Stock Exchange.